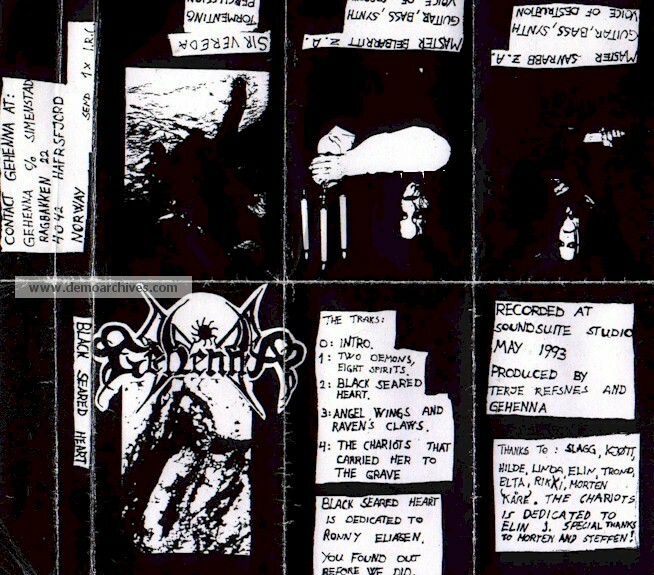 Stavanger Black Metal band GEHENNA debuted with the 1993 demo ‘Black Seared Heart’. The band’s initial line-up comprised of Sanrabb and Dolgar, both on vocals and guitar, with drummer Sir Vereda. The latter soon departed in favour of Dirge Rep (real name Per Husebø) and bass was taken over by Svartalv. With this roster of players, GEHENNA undertook their first live performance in February 1994. Xerox covers with regular tapes. Covers folded out. Around 100 copies made.